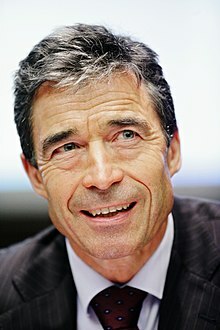 Anders Fogh Rasmussen (Dens pronunciation: [ˈɑnɐs ˈfɔʊ̯ˀ ˈʁɑsmusn̩] ( listen); born 26 Januar 1953) is a Danish politeecian who serves as the 12t an current Secretar General o NATO. Rasmussen served as Prime Meenister o Denmark frae 27 November 2001 tae 5 Aprile 2009. This page wis last eeditit on 18 Mairch 2017, at 17:23.